Cut the salmon into a large piece roughly the same size of your slow cooker. Sprinkle salmon with salt and pepper. Sprinkle on any other spices you’re using and rub them in with your fingers. Cut a large square of parchment or aluminum foil and press it into the slow cooker. This makes it easier to lift the delicate salmon out of the slow cooker later. Place a layer of lemon slices and sliced vegetables on the bottom of the slow cooker. Place the layer of salmon in the slow cooker, skin-side down. Top with more slices of lemon and aromatics. Choose a liquid to cook in. My standby is half water and half vegetable broth. You’ll need between 1 and 1 1/2 cups of liquid. Pour enough of the the liquid over the salmon to barely cover. Check the salmon after an hour and continue checking every 20 minutes until it’s to your preferred doneness. 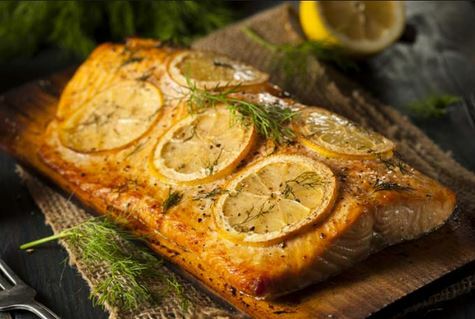 If you prefer fully cooked salmon, check it with a thermometer and make sure it reaches 145°F. Lift the salmon from the slow cooker using the parchment or aluminum foil. Tilt the paper slightly as you lift to drain off the liquid. Serve immediately, or cool and refrigerate for 3 to 4 days. Store leftover salmon in an airtight container. Enjoy!